2004-03-23 Application filed by Flixel Ltd. filed Critical Flixel Ltd.
A shutter (1602) for a transparent or apertured area, the shutter having an input and output side, comprising: a panel, arranged to selectably cover the area at a first position of the panel and to uncover the area in a second position; and an input light shaping element (1604) situated at the input side of the shutter and spaced therefrom, adapted to focus light (1608) that enters the array from the input side. US Provisional application 60/334,589 filed December 3, 2001 and of US Provisional application 60/361,321, filed March 4, 2002. November 22, 2001 and published as WO 02/42826. The disclosures of all of the above mentioned applications and publications are incorporated herein, in their entirety, by reference. Some of the subject matter of these applications is related to a best mode of carrying out the invention. This should not be construed as limiting the invention to embodiments which utilize all or even some of this matter. FIELD OF THE INVENTION The invention relates to the field of micro-machined and micro-formed devices with particular applicability to shutter arrays produced by micro-machining and applications of micro-machined shutters and shutter arrays. BACKGROUND OF THE INVENTION Some micro-display devices create an image that is optically projected for display. Current micro-display devices use transparent LCD devices, reflective LCD (LCOS) devices or reflective Micro Mirror Devices. Each has limitations of cost and performance, especially with regards to light intensity on screen and to contrast between the bright and dark state. Micro- display devices are also used in applications other than imaging for Spatial Light modulation. A constant demand exists for more efficient micro-display devices with lower manufacturing costs. A. micro-mirrors that reflect the light in slightly different angles according to the position to which the micro-mirror is switched; or, B. Reflective ribbons that control light reflection by creating diffraction gratings. The reflective nature of both these technologies impose projection optics which are cumbersome and expensive in relation to transmissive projection optics. They are often slow as well. Collection losses are also created in such devices due to an inherent mismatch of the collection optics etendue and the etendue of the micro-display devices. In addition, in many of these devices, the beam impinges at an angle to the array, causing distortion of the image. SUMMARY OF THE INVENTION An aspect of some embodiments of the present invention is concerned with electromechanical displays having very small display elements. In an embodiment of the invention, the display comprises pixels, each of which includes a panel that is mechanically flipped so that it is either in a CLOSED position, parallel to a surface on which it is formed or in an OPEN position, close to a vertical orientation with respect to the surface. In an exemplary embodiment of the invention, the axle is a horizontal axis. Optionally, the panel flips from one position (the CLOSED position) at which it is substantially parallel to (or at a relatively small acute angle to) a viewing face of the display to another position (the OPEN position) in which it is substantially perpendicular to (or at a relatively large obtuse angle to) the viewing face. The area under the panel when it is substantially parallel to the substrate is transparent, such that the panel acts as a light valve. Thus, the panel acts as a shutter for light, with light passing when it is the OPEN position and with light blocked when it is in the CLOSED position. As used herein, the term substantially perpendicular to means at an angle at which the aperture or transparent area associated with the panel is substantially uncovered. Generally this is 90 degrees +/- 10 degrees, although for some geometries, larger deviations are includable. Substantially parallel to means at an angle at which the aperture or transparent area is substantially covered. Generally, this is an angle of less than 15 degrees to the substrate surface. However, under some circumstances an angle of 30° or even 45° is acceptable depending on the geometry and focusing of the beam. In an aspect of some embodiments of the invention, light which is to be gated by the shutter device is focused. In an embodiment of the invention, an array of micro-lenses is provided, each of which collects light over its area and directs it toward one of the shutters. A potential advantage of focusing the beam is the efficiency of light collection and transfer of the array of shutters is vastly improved, and the percentage of the transparent or open area in the substrate becomes much less critical. In an embodiment of the invention, the light is focused or otherwise concentrated (collectively "focused") at a distance from the surface of the substrate. The inventors have found that when the light is focused above the surface, optimally at a point at which the edge of the panel passes when changing from open to closed. Under these circumstances, the switching time of the light passing through the shutter is reduced by a substantial amount, for example, by a factor of two, four, ten or more. PCB manufacture, microscopy, heads-up displays and chemical and biological substance identifiers. Other embodiments of the invention include use of the array of switchable shutters to temporally and spatially control the amount of light reaching the senor, for example, in sensor protection, eye protection, gated night vision devices, anti-glare/anti-blooming protection, accurate dimming, range increasing, camera shutters, IR sensors, such as pyrolectric sensors, for example for navigation and positioning. In some embodiments of the invention pertaining to use of the shutters and shutter arrays, substantially unfocused light or light focused at the plane of the substrate are used for the applications listed in the previous two paragraphs. Optionally, light focused above the height of the substrate, as described above, is used. As used herein, the term "rounded" means a cylinder or edge which has a generally rounded shape. The term includes a generally circular shape. It also includes a generally elliptical shape and all or a portion of a hexagon, pentagon or octagon or shape having a greater number of sides. It also includes a shape that is in the form of stepped layers having a generally round outline. There is thus provided, in accordance with an embodiment of the invention, a shutter for a transparent or apertured area, the shutter having an input and output side, comprising: a panel, arranged to selectably cover the area at a first position of the panel and to uncover the area in a second position; and an input light shaping element situated at the input side of the shutter and spaced therefrom, adapted to focus light that enters the array from the input side. In an embodiment of the invention, the panel opens toward the input side and wherein the lens has a focal point between the surface of the panel in the second position and the input lens. In an embodiment of the invention, the panel rotates substantially about a rotational axis thereof when moving from said first position to said second position; and the panel has a given extent in a direction perpendicular to the rotational axis. Optionally, the input lens is spaced from the panel, when in the first position by a distance smaller than twice, five times, ten times or twenty times the given extent. In an embodiment of the invention, the input lens has an optical axis and where an edge of the panel remote from the rotational axis crosses the optical axis during transition of the panel from the first to the second positions at a point more remote from the input lens than the focal point of the input lens. Alternatively, an edge of the panel remote from the rotational axis crosses the optical axis during transition of the panel from the first to the second positions at point closer to the input lens than the focal point of the input lens. Alternatively, an edge of the panel remote from the rotational axis crosses the optical axis during transition of the panel from the first to the second positions at a point having a given distance from the focal point less than 2%, 5%, 10 %, or 25 % of the focal length of the input lens. Optionally, an edge of the panel remote from the rotational axis crosses the optical axis during transition of the panel from the first to the second positions substantially at the focal point. In various embodiments of the invention, the face of the panel has a smallest dimension of less than or equal 10 microns, 20 microns, 50 microns, 100 microns, 200 microns 500 microns or 1 mm. In an embodiment of the invention, the shutter includes an output lens that focuses or collimates light that exits the shutter from the output side. Optionally, the output lens is spaced from the focal point or a conjugate of the focal point of the input lens at a distance equal to the focal length of the input lens. Optionally, the shutter includes a relay lens to project the focal point to point more remote from the panel. In an embodiment of the invention, the output lens has a focal length substantially equal to the focal length of the input lens. Alternatively, the output lens has a focal length different from the focal length of the input lens. In an embodiment of the invention, the output lens has a focal length adapted to focus light exiting the shutter to a point. There is further provided, in accordance with an embodiment of the invention, a shutter array comprising: a substrate having one or both of transparent and apertured areas; and a plurality of shutters according to the invention adapted to selectively cover and uncover the transparent areas. In an embodiment of the invention, the input lenses associated with the shutters in the shutter array comprise an array of micro-lenses spaced from the panels. There is further provided, in accordance with an embodiment of the invention, a shutter array comprising: a substrate having one or both of transparent and apertured areas; and a plurality of shutters according to the invention and including an output lens and adapted to selectively cover and uncover the transparent areas, wherein the output lenses associated with the individual shutters in the shutter array comprise separate output lenses for each shutter. Optionally, the output lenses comprise an array of micro-lenses spaced from the panels. Optionally, the input lenses associated with the individual shutters in the shutter array comprise an array of micro-lenses spaced from the panels. There is further provided, in accordance with an embodiment of the invention, a shutter array comprising: a substrate having one or both of transparent and apertured areas; and a plurality of shutters according to the invention and including an output lens and adapted to selectively cover and uncover the transparent areas, wherein the output lenses associated with each shutter are comprised in a single lens for a plurality of the shutters in the array. Optionally, the input lenses associated with the individual shutters in the shutter array comprise an array of micro-lenses spaced from the panels. There is further provided, in accordance with an embodiment of the invention, a system for light detection by a sensor on which the light is detected, the sensor including an input defining an input light path, the system comprising: a shutter array comprising an array of shutters comprising panels mounted on a substrate the panels being controllable to selectively allow light to pass through the substrate or apertures in the substrate, said array being situated in said input light path, wherein a face of said panels has a minimum dimension of less than 1 mm. In embodiment of the invention, where the imager is an imaging sensor, the system includes: a controller adapted to selectively control the states of the shutters and to receive signals from the imaging sensor, the signals representing light sensed by the sensor; wherein the controller reduced the light reaching at least portions of the sensor based on the received signals. In an embodiment of the invention, in a first mode, the controller controls the shutter array to expose the imaging sensor for a first period; and in a second mode, the controller controls the shutter array to expose the image sensor for a second period, responsive to signals received by the controller based on exposure during said first period. Optionally, in the second mode, the controller controls the shutter array to expose different areas of the sensor for different times during the second period, based on exposure during said first period. In an embodiment of the invention, the sensor is the eye of a viewer and including: a head mounting adapted to mount the shutter array in an optical field of view of an eye of a viewer; a separate sensor that is adapted to identify high intensity light in a field of view; a controller which is adapted to receive information regarding a position of said high intensity light in the field of view from the sensor and is further adapted to control the shutter array responsive to said information. In an embodiment of the invention, where the sensor is an imaging IR sensor the system includes: a source of IR radiation adapted to illuminate a field of view of the sensor with pulses of IR; and a controller which is adapted to control the source and shutter array to block light from reaching the sensor for a given period after the pulses are generated to avid blooming. Optionally, the system includes a controller that is adapted to control the shutters in the shutter array to operate with a variable proportion of time in the first and in the second positions, said proportion being responsive to the intensity of light viewed by system. Optionally, the proportion is different for different portions of the shutter array. Optionally, the sensor is not an imaging detector and a single input lens is used to focus the radiation on a plane and the system includes: a controller that sequentially opens single shutter or groups of shutters to illuminate the sensor with irradiation and which receives information from the sensor related to the intensity of the irradiation; and image generation circuitry that is adapted to generate an image of the variations in the input radiations based on the locations of the opened shutters and the intensity information associated with each opening. In an embodiment of the invention, the shutter array is a shutter array according to the invention. There is further provided, in accordance with an embodiment of the invention, a method for generation of a radiation pattern comprising: providing a source of light, having a field of illumination; providing a shutter array according to the invention placed in said field; and controlling passage of light through the shutter array. Optionally the method includes: providing a photosensitive surface; wherein controlling comprises controlling the shutter array to illuminate the photosensitive surface with an image. In an embodiment of the invention, the photosensitive surface is a coating on a printed circuit board precursor. Optionally, an area of greater than 50 square centimeters is illuminated at one time. There is further provided, in accordance with an embodiment of the invention a method of illumination comprising: providing a precursor of a biochip having areas thereon to be selectively irradiated to produce the biochip; and selectively irradiating said areas by controlling light passing through selected ones of the light valves in an array of light valves. There is further provided, in accordance with an embodiment of the invention, a method of illumination and detection, comprising: providing a biochip from which information is to be detected; selectively irradiating areas on the microchip by controlling light passing through selected ones of light valves in an array; detecting reflection from said areas. Optionally, the light valves are controllable shutters and wherein the array is an array of said shutters. Optionally, the shutter array is a shutter array according to the invention. Fig. 19 shows RF switching apparatus, in accordance with an embodiment of the invention; and Fig 20 is a side view of a compound RF switch having a detachment lever, in accordance with an embodiment of the invention. Figs. 1A-1D show an overview of an exemplary pixel 10, in accordance with an embodiment of the invention. While this construction is presented as an example, many of the elements shown can have a different construction and some may be deleted altogether. Pixel 10 comprises as its major components a flipping panel 12, closing electrode 101, opening electrode 102, clutch electrodes 103, stopping nub 104, row locking electrode 105, column locking electrode 106, levitation electrode 18 and a pair of sockets 21. The panels are formed with preferably rounded axles 26, which fit into sockets 21. The sockets comprise a lower, optionally wedge shaped, element 30 (sometimes referred to herein as a "knife 30") formed with an upper edge on which the related axle rolls, a pair of side motion constraints 22 and an upper constraint 24. Each electrode is optionally formed with an optionally insulated nub 28 which minimizes the area of contact between the panel and the underlying structure. Fig. 1A shows an isometric view of the pixel in one position, Fig. IB shows an isometric view, where panel 12 is removed to show the structure underneath it, Fig. 1C shows a view of a socket 21 with an upper constraint 24 removed and Fig. ID shows a cross sectional view of socket 21, including a poly 0 layer 34 on which knife 30 sits and vias 36 and 40 that connect the parts together mechanically and electrically. In the method of construction described below, the base structure is made essentially of interconnecting (addressing) layers Metal 1 (Ml) and Metal 2 (M2), over a quartz, fused silica or glass substrate 8. For some embodiments, a transparent plastic substrate may be used. In the structure described, the column and row addresses are in metal 1 and metal 2, Addressing lines for electrodes 101 and 102 are also in the column addressing layer, with the lines placed between the column address lines. The row and column addressing lines are covered with silicon oxide and by silicon nitride. Shielding using intervening lines or layers is optionally provided. Via holes connect the addressing lines (and voltages for electrodes 101 and 102) to the Polysilicon structure above. The Polysilicon structure, which is deposited in three layers, designated Poly 0, Poly 1 and Poly 2. In other embodiments, the structures can be metal or even plastic (metalized or made conducting by other means). For ease of visualization, the layers are indicated with a same type of diagonal cross-hatching with layers 0 and 2 having right leaning diagonal lines and layer 1 having left leaning diagonal lines. In general, all of the polysilicon is made conducting. In an embodiment of the invention, electrodes 101, 102, 103, 105 and 106, (including nub 28, knife 30 and stopping nub 104) and- the base of the side motion constraints are laid down in Poly 0. Panel 12 (including axle 26) and side motion constraints 22 are laid down in Poly 1 and levitation electrode 18 and upper constraint 24 are laid down in Poly 2. Electrification lines for the levitation electrodes and grounding for the hinges are provided in, Poly 2 as well. It should be understood that areas not covered by polysilicon material are transparent, such that when panel 12 is substantially perpendicular to the surface of substrate 8 (the OPEN position), the pixel (or rather that part under the panel in the closed position) is transparent and when the panel is substantially parallel to the surface (the CLOSED position), the pixel is not transparent. In some embodiments of the invention, one or both faces of the panel are coated with a light absorbing coating, to reduce reflections and transmission. Additionally, or alternatively, all exposed surfaces (except for those immediately below panel 12 in the CLOSED position) are coated with a light reflecting material. Optionally, the reflected light is absorbed somewhere else in the system. Absorbing material could also be used. However, the light absorbed may cause excessive heating of the micro-display. In an embodiment of the invention, optional clutch electrodes 103 are energized together, pulling the axle down, ensuring good electrical contact between the axle 26 and the knife 30. Axle 26 contacts the upper edge of knife 30 (which is grounded), and is also connected to nub 28 (by a line in poly 0, not shown) so that panel 12 is grounded with them. Optional levitation electrode 18 is separately electrified (via an elevated line in poly 2, which connects all of the levitation electrodes in a column together). Opening electrode 102 is also separately electrified. It should be understood that if one or both of the addressing electrodes are positive, neither the levitation nor opening electrodes are operative to flip the panel to the OPEN position. For ease of understanding of the opening operation, Fig. IE illustrates a cross- section of the pixel structure between the hinges along a cut perpendicular to electrodes 101 and 102. In this cross-section only opening electrode 102, closing electrode 101 and panel 12 are cut. Stopping nub 14 is shown, but not cut through. As illustrated, panel 12 is formed with a tail end 13 that extends beyond axle 26 (shown in Fig. IE in white, to illustrate its position). A long slot or series of slots 15 are optionally formed in panel 12, on the other side of the axle from the tail. The function of tail 13 and slots 15 will become evident in the following discussion and is described in WO 02/42826. It should be understood that while the voltage is indicated as being positive, the flipping works in exactly the same manner whether the voltages are positive or negative, especially if the panel is at ground potential. Furthermore, voltage levels may be different for the different electrodes (with some additional complexity in supplying the voltages) or AC voltages may be used. Fig. 5 illustrates a possible timing diagram for opening and closing a panel. In Fig. 5, at t0, the system is at rest and the levitation electrode is electrified. The clutch electrodes 103 are always electrified. The opening electrode is turned on. (Fig. 2A) At tj the levitation electrode 18 is turned off. (Fig. 2B) At 13, the opening electrode 102 is turned off. (Fig. 2C) The panel continues to rotate until it hits stopping nub 104. (Fig. 2C) For the selected panel, the locking electrodes are both at zero voltage so that they do not inhibit the flipping. However, after the flipper passes the levitation electrode, they can be turned back on, since they are shielded from the panel by the levitation electrode. Alternatively or additionally, only the tail portion and the portion at the opposite edge of the panel are made conductive (with a conductive strip connecting them both to the axles). This obviates the need for cut-outs 15. In the practice of an exemplary embodiment of the invention, the pixels are arranged in rows and columns with the addressing Lines 107 and 109 of Fig. 6 connected to row locking electrodes 105 of Fig. 1A and to column locking electrodes 106 of Fig 1A, respectively. All levitation electrodes 18 are connected together and are thus electrified together. All closing electrodes 101 are connected together and are thus electrified together. All opening electrodes 102 are connected together and are thus electrified together, as are all clutch electrodes 103. As the opening sequence described above is executed, only those pixels for which both the row and the column locking electrodes are grounded may open. Any pixel with either locking electrode electrified will remain in its position. STABILITY OF OPEN PLXELS The locking electrodes cannot close an open pixel since their effect is shielded by the overhanging levitation electrodes. Levitation electrodes cannot close an open pixel since their effect is weak compared with the stiction forces of the stopping nub 104, due to their distance from the panel in the OPEN position. It has been found that, for practical purposes, the stiction between panel 12 and nub 28 is often sufficient to hold the panel in place. As a further effect, the attraction of the panel to closing electrode 101 serves to position the panel on the knife in a position ready for closing. Variations in construction and flipping methodology will be apparent to persons of skill in the art. Some methods of flipping utilize the principle described above (flipping by attracting the tail to the electrodes and utilizing the levitation electrode to control the flipping). Other methods however, such as those described in the publications in the related applications section, can be used for flipping. Fig. 6 illustrates the first stage of an exemplary methodology for the fabrication of a pixel as shown in Fig. 1, in accordance with an embodiment of the invention. Of course, an entire array of such pixels as partially shown in Figs. 10 and 11, can be produced by the method on a single substrate. The following are the acts in the process. In general, each deposition of an oxide or glass layer is followed by an anneal. It is noted that the method described is based on the process technology utilized by a particular foundry and that details may vary, even for the same process methodology. It should also be noted that for some of the oxide etches, an overlying nitride layer is used as a mask and for at least some of the polysilicon etches, the nitride and/or oxide layers are used as a mask. 02/42826, and is not repeated here. The only major difference is the provision of address lines in poly 2 as described below. 107. It is typically 0.25 microns thick. (B) This layer is etched to form a first set of addressing lines. (C) The second metal layer (M2), (possibly TiW or another heat resistant metal), is indicated as 109. It is typically 0.25 microns thick. (E) Between the two metal layers there is an insulating oxide layer, indicated as 108 (D). It is typically 0.25 microns thick. M2 is then etched to form a second set of addressing lines. (F) Typically one set of lines is a column address line and the second is a row address line. The second metal is covered by an (optionally polished) oxide layer, typically 1 micrometer thick. (G) An acid protection and insulating silicon nitride layer (H) is indicated as 54. It is typically 0.6 micrometers thick. Heat resistant conductors are used since the laying down, doping and annealing of the polysilicon are high temperature processes. Vias' 111 are formed in the oxide layers (I) to bring the metal layers in contact with selected elements that are formed above nitride layer 54. Preferably, ion or plasma etching is used. A Poly 0 deposit (J), typically 2 micrometers, indicated by reference 56 is then laid down. The poly 0 material fills the vias and selectively attaches the metal layers to the poly 0 layer. The Poly 0 deposit is then etched to form the nubs 18, knives 30, stopping nubs 104 and electrodes 101, 102, 103, 105 and 106. (K) The poly 0 layer it is made conductive by process L.
Details of this etching operation are found in the above referenced WO 02/42826. Optionally, the axles are rounded as described in the disclosure relating to Figs. 8A-8D of WO 02/42826. The reader is referred to that publication for details, which are not repeated here. It will be clear that the pixel can be made of materials other than polysilicon. In particular, instead of the poly layers, metal layers can be deposited and appropriate polymer sacrificial layers and etchants used. Since all of the processes involved can then be at relatively low temperatures, non-refractory metals or metals that plate at low temperatures can be used. This allows for both the addressing metal layers and the panels, electrodes, etc. to be of Cu, Ni, Co, Cr, Al or suitable alloys or other suitable metals. Furthermore, since oxides are not required for sacrificial layers, the use of hydrofluoric acid is obviated, which avoids any danger of damage to the quartz or glass substrate. Finally, appropriate plastic materials can be used in the process, optionally together with metal and/or polysilicon materials. Fig. 7 shows an alternative configuration for axles 26 and knifes 30. As shown, the axes are not perpendicular to the centerline of the panel. The angle of the axles with the axis of rotation is exaggerated for clarity and would generally be between -10 and +10 degrees from the normal shown in Fig. 1. This configuration minimizes the contact area between the axles and the knives in the open position, such that even if the axles are not round and the knives are not sharp, the contact between the two is reduced to a point. It is noted that although in Fig. 7 the knife appears as perpendicular to the axle it may be as much as 20 degrees or more out of perpendicular. As an alternative to stopping nub 104, a bridge at poly 2 may be formed between the tops of sockets 21. This bridge will prevent the panel from passing the vertical. If such a bridge is provided, stopper nub 104 may be omitted. Fig. 8 shows an alternative methodology of forming stopping nub 104. As indicated above, stopping nub 14 is formed in Poly 0 and the flipper panel is formed in Poly 1. Thus, misalignment between the two layers will manifest itself in the stopping edge being closer to or farther from the axis. However, the position of the stopping nub is fairly critical, since if it is too close to the axle the flipper will only open to a smaller angle and if it is too far from the axle, the tail of the panel will not hit the stopping nub. In the illustrated construction, the flipper (poly 1) is etched with a hole 80 to expose the oxide below. A window 90 is formed in photo-resist material. Oxide and poly etch steps follow, resulting in a precisely cut stopping nub at edge 81 which forms the final stopping surface of stopping nub 104. This methodology results in a precise positioning of the stopping electrode with respect to the flipper panel and a flat, precise edge for the stopping. Fig. 9A illustrates a structure for panel 12 that obviates the need for nub 28. As described in the applications listed in the related applications section, the nub is present to reduce the amount of stiction in the CLOSED position. Were the edge of the panel allowed to touch the substrate, the contact area would be so high that it would require an excessive voltage to raise the panel. Using a small nub 28 reduces the stiction. However, while for the reflection panels of these publications the nub was not a problem, in the present embodiment the nub sits in an area that should be clear to provide maximum open area. Furthermore, for optimal operation, the nubs should be grounded, which requires a (possibly opaque) line to the nub from the hinge/socket. In the structure of Fig. 9A, two appendages 92 are provided at the end of panel 12. These appendages have a small tip 93, such that contact between the panel and the substrate is minimized. This reduces stiction and obviates the need for nub 28, while providing a greater open area. Fig. 9B illustrates a variation of the embodiment of Fig. 9A, with a single appendage 92 with a slanted edge 94 for ease of detachment. This may result in lower stiction, since, the detachment from the substrate is by a peeling action. Since for both Figs. 9 A and 9B panel 12, at the CLOSED position, is lower than when it rests on nub 28, the levitation electrode may be produced in poly 1 rather than in poly 2. This has the advantage of more accurate positioning of the electrode with respect to the panel. An additional poly 2 levitation electrode may be fabricated above the poly 1 levitation electrode, to increase the effect of the electrode. Fig. 10 shows a layout of address and locking lines, in accordance with an embodiment of the invention. For clarity, the sockets 21 are not shown and panel 12 is shown for reference. One of the metal layers (either Ml or M2) comprises row lines (as shown) and the other comprises column lines. The choice of which metal layer provides column or rows is optional. As shown in Fig. 10, the pixels are optionally configured so that the panels associated with adjacent columns open in opposite directions. This reduces the number of lines needed, since a single line can be used for all closer electrodes in two columns. The same line electrifies clutch electrodes 103. In the embodiment shown, opening electrodes 102 in each column are fed by a common column line 1002. (For simplicity of presentation, opening electrode is shown as a single electrode, rather than being split as in Fig. 1.) Closing electrodes 101 and clutch electrodes 103, in adjacent columns are fed from a common line 1004 since they are adjacent, for the configuration shown. All column locking electrodes 106 in each column are fed by a common line 1008; all row locking electrodes 105 in each row are fed by a common line 1006. Referring again to Fig. 5, the voltages shown in the opening cycle of the upper four graphs are applied to the respective electrodes in each opening cycle, as shown. If one of the locking electrodes (either or both of row and column) is electrified, the particular pixel will not open. Thus the pixels are scanned by scanning the row and selecting column electrodes to select pixels that are to be opened in a particular cycle. In practice, according to an embodiment of the invention, a frame time is divided into a multiplicity of cycle times, equal to the number of brightness levels to be displayed. For each cycle the proportion of the time that the respective pixels are to be open is determined, from the number of brightness levels to be displayed. At the start of the frame, all of the pixels are in the CLOSED position. Then during the first cycle all of the pixels having the highest brightness level are opened. These remain open for the entire frame. In the next cycle, the pixels having one brightness level lower are opened. These also remain open for the rest of the frame. This process continues until all of the brightness levels have been scanned. At the end of the frame, a single CLOSE cycle is performed. This method allows for a large number of brightness levels without excessive energy use and without excessive wear on the pixels. Fig. 11 schematically shows how the sockets 21 (and hence, knifes 30, panels 12 and nubs 28) are grounded and also how levitation electrodes 18 are electrified, in one exemplary embodiment. As shown, levitation lines 1102 and hinge lines 1104 are provided. In essence, all of the sockets 21 in adjacent columns are grounded using a common line 1104 in poly 2 and all of the levitation electrodes 18 in a column are connected together utilizing levitation line 1002 in poly 2. In fact, the levitation electrodes can be formed as a single long bar in poly 2, which serves both to supply levitation voltages and to raise the panels. For simplicity of explanation, the levitation electrodes and the sockets of adjacent pixels have been described above as being separate and being energized or grounded by some means not shown. Two main types of transmission type displays are known. In one of these a light source illuminates three separate micro-displays, each with one of red, green and blue light. The modulated light from the three micro-displays is then either combined and projected or projected as overlaid images on a screen. A common light source can be used and split into the three colors or separate light sources can be used for each channel. Fig. 12 shows a projection device 1200 similar to those in the prior art (see, for example, http://www.projector people.com/news_info/lcd-view.asp) except that a shutter array micro-display, as described above is used instead of an LCD for modulating the light. In display 1200 light from a white light source 1202 impinges on a red dichroic mirror 1204, such that the beam is split into a red beam 1206 and blue and green beam 1208. Beam 1208 impinges on a blue dichroic mirror 1210 such that it is split into a green beam 1212 and a blue beam 1214. Beams 1206, 1212 and 1214 are fed (via mirrors 1215) into three transmission type micro-displays 1216, 1218 and 1220, according to the present invention, in which the light is spatially modulated to form red, green and blue images respectively, that are transmitted through the micro-displays. The light from the micro-displays is combined in a dichroic combiner cube 1222 and projected by a projection lens 1224 onto a screen. Another type of common projection display is one in which a color wheel is used to change the color of light periodically, so that different color separation images are serially produced. Such devices are also useful with the micro-displays of the present invention. Fig. 13 shows a projection system 1300 in which a light source 1302 is focused onto a color wheel 1304 by a lens system 1306. Focusing of the light source is desirable so that the entire image, at any one time, has the same color. The light from the color wheel is collimated by optics 1308 and impinges on a micro-display 1310 according to the present invention. The light passing through the micro-display is projected by projection optics 1312 onto a screen. Alternatively, color may be added to the image displayed by providing that some of the pixels have a red color, some have a green color and some have blue color. This can be implemented by providing a transparent color coating for each of the pixels and by grouping the colors so that groups of three pixels foπn a full-color "super pixel". The colored images can be generated all at the same time or can be generated sequentially. Alternatively, the color can be added as a transparent overlay on or spaced from the substrate on which the panels are formed. In general, the shutter arrays described herein are compatible with other known image generating schemes or optical switches utilizing LCDs (or other transmission type micro- displays) in which the LCDs can be replaced with the shutter array. In both Figs. 12 and 13, drivers for the micro-display, power supplies and, for Fig. 13, a synchronizing system are not shown, but are, of course, present. Both Figs. 12 and 13 are capable of proj ecting both still and moving pictures. It should be understood that the percentage of the area of the array that is transparent can be high, reaching 60, 70, 75 or even 80% of the total area. The drawings, are not to scale, and are drawn for convenience of presentation of the principles of the invention. Furthermore, due to the small sizes possible using MEMS technology, arrays with many thousands, a million or even several million addressable pixels is possible, resulting in a high resolution display. However, addressing speed may be a concern for large arrays, if many brightness levels are to be displayed. In order to increase the speed, additional address lines may be provided to divide the array into sub-arrays, which are addressed in parallel. Structures similar to those described above can be used as filters for filtering light that enters an imaging or other receiving system. The constructional variation is that the panels are transparent to a particular band of wavelengths, rather than being opaque. For example, if an array as described above is placed in front of an imaging system and the panels are opaque to visible light and transparent to IR, when the panels are in the OPEN position, all light will pass and a visible light image will be produced by the imager. If all of the panels are in the CLOSED position, the array passes only IR and the image produced by the imager is an IR image. The filter can be very quickly changed from visible to IR and, if desired, a portion of the aperture can pass IR and a portion can pass visible as well. If the entire array is to be switched together, the row and column locking electrodes (and address lines) can be omitted. It is noted that the size of a switchable filter according to the invention is small compared to that of prior art mechanical devices, in addition to being faster. Figs. 14A and 14B show OPEN and CLOSED positions respectively for an array 1400 of shutter pixels 1402 in which the light impinging each pixel in the array is focused by a lens, such as a micro-lens 1404, in accordance with an embodiment of the invention. The micro- lenses 1404 form an array 1410. As shown in Fig. 14A, in the OPEN positions, panels 1406 are perpendicular to the substrate surface and allow radiation to pass through openings 1408. In the closed position, shown in Fig. 14B, the openings are blocked by the panels. h order to re-collimate the light (or at least to bring it back to the same state it was in when it was focused by array 1410, an optional additional array 1412 of micro-lenses (an output array), is optionally situated after the array of shutters. Optimally, the focus of the micro-lenses of arrays 1410 and 1412 coincide so that the collimation is conserved. Furthermore, the lenses optionally have a same focusing power, so that the two lens arrays are symmetrically placed about the focuses. This maximizes the light capture of array 1412. Since, for practical thicknesses of substrate, it may be inconvenient to place array 1412 so close to the pixels, a lens, such as lens 1606 (shown in Fig. 16) to form a conjugate of the plane of the focus points further away from the substrate. Other optics to perform the same or other desired functions can also be used. Alternatively, a direct viewing screen (for example a diffuser, can be placed substantially at the position shown for array 1412 (i.e., near enough to the position so that the image is not defocused to an undesirable degree. Alternatively, the output microlens array can be adhered to a back surface of the substrate, if it has an appropriate thickness, or the output microlens array can be formed in or on the substrate. Alternatively, the output light can be captured by an assay of fiber optic light-guides and transported to diffuse surface or other display. Use of a micro-lens for each pixel allows for greater flexibility of design and manufacture, such that the amount of the transparent area need not be very high (for example, less than 50% or even less than 40%, 30% or 20%) without negatively impacting the efficiency of transmission. Micro-lens structures at the small pixel sizes possible in manufacturing the array can be constructed utilizing methods known in the art. It should be understood that while the pixels are all OPEN in Fig. 14A and all CLOSED in Fig. 14B, for many uses of the array, at any one time, some of the pixels will be in the OPEN state, while others are in the CLOSED state. Figs. 15 A and 15B schematically show light transfer at ten positions during the opening of a pixel, in accordance with an embodiment of the invention. Fig. 15 A shows the system with unfocused light and Fig. 15B shows the light for the pixel focused using microlens 1404. Fig. 15C shows the amount of light transmitted for each of these positions (as well as for intermediate positions) for both focused an unfocused light. Both curves are normalized to the maximum transmission for the particular configuration. As is clearly seen, the switching time of the transmitted light is improved substantially. The amount of improvement depends on the position and size of the focus. In principle, if the focus just touches the tip of the panel as it passes the focus, the rise time is practically instantaneous. On the other hand, if the focus is at the surface of the substrate, the rise time is longer, but is still improved over the unfocused situation. The amount of improvement in switching time relative to a non-focused configuration will also depend on the distance of the micro-lenses from the array, especially if the focal length is increased as well, with larger distances (and corresponding longer focal lengths) resulting in faster rise times. In practice, a tradeoff is optionally made between ease of construction and rise time. It is noted that less focusing power is needed when the lenses are further from the panel. In the example shown in Fig. 15B, the focus is somewhat closer to the substrate than the optimal point, such that the improvement in rise time (10% to 90%) is about a factor of four. An alternative method for increasing the efficiency of light transmission, in accordance with an embodiment of the invention, particularly when the overall light impinging on the array is not well collimated, is to coat the surfaces of the panel with a reflective coating. This will pass light impinging at an angle through the opening in the substrate. However, since this light is neither focused nor collimated, further processing of this light is more complex. In some embodiments of the invention, especially when the light is focused, the surfaces of the panel are made substantially non-reflecting to reduce the amount of unfocused light passing through the aperture in the substrate. Figs. 12 and 13 showed two methods of providing a tri-color display, utilizing embodiments of the invention. Although originally described with respect to the embodiments of the invention, not including focusing, they are applicable to the arrays with focusing to improve transition time, as described above. However, the applications shown in Figs. 12 and 13 are by no means the only applications of the arrays, according to the various embodiments of the invention. For example, the general structure of Fig. 13 (with or without the improved structure of Fig. 14) can be used in a personal display module. In this case, it my be appropriate to dispense with the output microlens array and place a diffuser at or near the plane described above for the microlens. The diffuser can then be directly viewed. Alternatively or additionally, the back of the substrate is a diffusing surface and is itself directly viewed. Magnification of the diffuse surface can also be provided. Furthermore, array methodology of the embodiments of the present invention allow for the pixelwise irradiation of plates to form latent or visual images thereon. Thus, in digital printing, it is normal to expose a photoreceptor in the shape of a drum which rotates. A large array, in accordance with the present invention, can be used to expose an entire plate or flat sheet (or a large portion thereof) at one time. In this case, the array is a programmable mask for exposing the plate. It is understood that the amount of energy need to expose an entire plate is not small and that this would require a relatively long exposure time. Alternatively to using a large array, radiation leaving a smaller array can be magnified (projected) onto the surface. A second field of similar use is in exposing a printed circuit board (PCB) to form a photo-resist image on the board, prior to etching. PCBs are used to place and connect electronic components in modern electronic equipment. The PCBs are usually manufactured by beginning with a dielectric substrate material such as a plastic, ceramic, or glass compound. This substrate material is then coated with a thin layer of conductive material (usually copper). The conductive material is then covered with photo-resist, which is exposed according to a predefined mask pattern that describes the interconnecting lines to be formed on the substrate. When a microlens array is used before and after the array of panels, the amount of dead space is minimal. In general, this process is performed using either a film mask (in which case the entire board is exposed at one time using a strong uniform light source) or by scanning the board from side to side with a beam while the board is moved past the scanner. However, each of these has its own associated problems. In addition, the need to manufacture a new mask for each new PCB design increases the price of new PCBs, especially during the developmental phases where many different designs may be contemplated. A shutter array as described above may be used as an electronic mask, where a pattern is created by electronically controlling the array. The pattern is physically created by opening some shutters while leaving the others closed. This forms a pattern of exposing light on the board. Use of a shutter array allows, in accordance with an embodiment of the present invention, for exposure of all or part of a board without placing a film on the board each time an exposure is desired. A third field in which pixel-wise exposure is used is the field of Bio-Chip array manufacturing. DNA Synthesis on Biochips includes intermittent exposure of respective materials to radiation, thereby controlling a separate synthesis process for different wells within a complete biochip. Areas on a micrometer scale need to be exposed to light without cross- exposure and with accurate timing. Shutter arrays of the invention enable such light exposure control of micron scale areas freeing users from the need to use complex mechanical systems and expensive masks. Fig. 16 shows a bio-chip exposure system 1600 including a shutter array 1602, a pre- focusing micro-lens array 1604 and a post micro-lens focusing element such as lens 1606. A light source 1608 is approximately collimated by a lens 1610, prior to impinging micro-lens array 1604. The incoming radiation is focused at the individual pixel elements and passes through those pixels that are OPEN. The resulting output radiation is focused by focusing lens 1606 onto a bio-chip 1612. The radiation at each element of the bio-chip can be controlled by controlling the duration of the opening times of the individual shutter elements. Alternatively, separate lenses may be provided for each of the shutters (for example in a micro-lens array). These lenses can have a different focal length than lenses 1604, and would focus the light exiting the shutters on the biochip. As indicated above, the shutter arrays of the present invention can also be used for illumination in various fields of microscopy. Microscopes irradiate a target and monitor the reflected and refracted light patterns to detect details of the target/viewed element. To view the specific reflection of a certain area on the element, an X-Y table is generally used to move the target/viewed element. Use of a pixel array illuminator enables the "movement" of the optical field (by changing those shutters that are open and closed) thus saving the need for (expensive, and or inaccurate) X-Y mechanical movement. This can be especially useful when performing 3 dimensional microscopy, in which the height is determined from characteristics of the reflection from specific area. The shutter arrays of the present invention are especially useful in the field of analytic microscopy, in which light reflected by or produced by (in response to radiation) a small area on a surface is analyzed. One such filed is bio-chip detection. After a bio-chip is used, a detection phase follows. In this phase, sequential areas of the chip are exposed to light and the reflection is measured. At present detection is performed using scanning with mirrors and other such methods. Such technologies are time consuming due to the slow response of the scanning mechanism. Use of the shutter array allows "moving" the optical field rather that a mechanically scanning element. Another field of use is in heads up displays. Heads-up displays are projection systems in which a virtual image is projected through the use of semitransparent mirrors onto the viewer's immediate field of view, or example, onto a windshield. The image is created to be viewed concurrently with the scene ahead. Head-up displays require very high brightness for projected images so that they can be viewed even against bright sunlit backgrounds. They also require very high contrast ratios to ensuring that no radiance appears where no information is projected resulting in a type of glare that can reduce the contrast of the field of view of the operator, who may be a pilot or a driver of an automobile, which can cause loss of detail (or even entire objects) and result in image misinterpretation. In current projection technologies using DLP and LCD, high brightness comes at the cost of low contrast and creates a background "haze". The mechanical shutters, such as those described herein allow for high-brightness/high-contrast images by completely blocking the light path in areas where no image is to be displayed. Shutter arrays as described above are also useful in Chemical/Biological Substance identification. The quick identification of chemical and biological substances is essential in protection from exposure to biological and chemical hazards. Identification may in many cases be achieved by irradiating a suspected material with precise amounts of energy in specific wavelengths. The reflected and refracted photons can then be inspected in order to identify the suspected substance. The shutter array may be used in such a mechanism to control the amount of radiation reaching the suspected material and its spatial distribution. Use of the shutter array offers high efficiency due to the high fill factor and transmissivity. Quick reaction time of the shutter allows precise control the amount of energy reaching the suspect material. Shutter arrays, such as those described above, are also useful for various radiation control functions. Table 1 presents an outline of exemplary uses of pixel arrays, as described above, in the field of spatially and temporally controlling the amount of radiation reaching a sensor. TABLE 1: Fields of use for the disclosed pixel array for various radiation sources and sensors These applications are described in the following disclosure. Sensor protection is critical when a sensor or sensor array is exposed to an environment in which harmful or too high power radiation may reach the sensor. This is especially true in the military field where hostile radiation may be specifically targeted at the sensor array in order to harm it. It is also relevant in IR thermal measurement systems, night vision systems and measurement systems. A pixel array may be used in this case to block part or all the "field of radiation" ("field of view" of the radiating source) for any required time period, thereby allowing the sensor to continue collecting information while blocking out "problematic" radiation. In an embodiment of the invention a sensor system comprises a sensor array (for example a CCD array) and a shutter array. Optionally, the shutter array is very close to the sensor array. Each shutter of the array controls radiation impinging on one or a small group of pixels of the sensor. For example, areas of 2x2 to 4x4 could be associated with a single shutter. Optionally, larger groups of pixels or rectangular or irregular pixel groups could be associated with a same shutter. In a normal prior art exposure system, using mechanical shutters, one or more shutters would be used, with the shutter open for either a predetermined time or for a time determined by the actual charge collection. In an embodiment of the invention, in which the sensor is protected, a two step process is performed. First a short exposure is performed, and an image acquired, with all the shutters open. The controller checks the image for bright areas and determines which areas of the sensor need protection. A longer exposure is now taken. Optionally, the exposure time is somewhat shorter than a full frame time to keep the frame rate constant, taking into account the previous steps time. The controller sends commands to the shutter array to keep some of the shutters closed (for all or part of the exposure time) thus protecting the CCD pixels from over exposure. This will enable the CCD pixels to gather the image information except for the pixels that are covered with the closed shutters. If the shutters are closed part of the time, it may be possible to image the entire area of the CCD, with reduced contrast for the brighter areas. Eye protection is critical in an environment (such as in the presence of certain lasers) where the person is exposed to radiation damaging to the eye. Such environments exist either in a work environment (such as that of laser technicians), or in the military battlefield. In the battlefield the irradiation of the eye with harmful radiation, may even be intentional from an offensive force. Completely blocking the eye's field of view to all potential harmful wavelengths is impossible as due to the wide range of possible offensive laser wavelengths this will, if carried to an extreme, render the user blind to all incoming light. The shutter array may be used in this case to either block the complete field of view for a short time period, or to block only the part of the field of view from which the radiation is coming. One method of protecting the eye of the viewer is to provide a CCD camera (for example, as described immediately above) or other imager which is protected from and can identify high intensity light. Provide two shutter arrays fitted on goggles (they could be considered to be "smart sunglasses"). The controller reads the imager and maps directions with high intensity light source. The controller then commands the shutter array to shut the appropriate pixels in the line of sight from the detected high intensity light source and the eyes. < imager can be mounted on the goggles so that the relationship between the shutter array and the image on the imager is fixed. Optionally, other methods of measuring the light distribution can be used as an input to control the opening of the panels. To enhance the image created by a night vision system, IR radiation is sometimes used to illuminate the observed area during exposure. Laser IR sources are sometimes used to illuminate from a distance. It may then be necessary to gate the incoming radiation through a quick shutter to control the distance from which radiation is gated into the night vision system, thus differentiating between low and high-intensity return signals. If this is not performed correctly the radiation returning from close proximity of the night vision system will effectively blind the system (causing so called "Blooming" - see below) losing the lower radiation information returning from far off objects. Fig. 17 shows a controller 1720 which controls both a laser source 1722 and shutter array 1702. Based on either a user input or other range information, the controller gates shutter array 1702 open at a times corresponding to a desired range window and blocks the input of light to the sensor for other times. Thus, the shutter array may be used in this case as a quick shutter to gate the night vision system and/or that image part with high intensity return signal (or noise) and, allow only radiation reflected from a distant target (low intensity signal) to reach the night vision system. 4) Antiglare/ Anti-Blooming System and Dynamic Range Increase When an individual detector (or group of detectors) within a CCD array reaches saturation this may deteriorate the behavior of the other detectors within the array effectively blinding an area within the CCD. This effect is also well known in the context of IR or Night Vision detectors where it is commonly referred to as "blooming". This effect may be nullified by either entirely or partially blocking the radiation reaching the saturated pixels. This can be achieved by placing a shutter array in the path of the incoming radiation, before the CCD array (or Night Vision or IR detector Array or other type of radiation sensitive detector). Controller 1720 receives signals from sensor 1714 or individual sensor elements indicative of the onset of saturation and reduces the amount of radiation reaching all or part of the sensor. The shutter array nullifies glaring/blooming by closing the shutters above the saturated sensor pixels. This reduction of blooming can be achieved either by reducing the radiation to zero when a threshold (local or global) is reached, or by reducing the duty cycle of the opening of the shutter (e.g., turning the shutter on and off rather than having it open all the time), i.e., temporal control of the shutters. This will limit, but not block completely, the radiation reaching the pixel through the shutter array. In an imaging situation, this type of bloom reduction can be used to attenuate the radiation from more radiant areas as compared to other areas. This will increase the input dynamic range at the cost of a reduction of the contrast of the image, but will avoid saturation and/or blooming. This methodology can also be used to change a sensor from a sensor for high intensity detection (in which case all of the shutters are closed a greater part of the time) to a detector for low intensity detection (in which all of the shutters are open all or nearly all the time). More than one range of measurable intensities may be provided, by varying the OPEN duty cycle. Combinations of modulation schemes can be used to choose a range of intensity values which will be detected with optimal contrast. (i). When radiation levels fall more shutters may be opened to increase the passing radiation. When radiation levels increase more doors may be shut to decrease the radiation passing the array. In this manner a stable level of radiation may be attained for a prolonged period. This method is applicable only for a non-imaging sensor. (ii). Time domain modulation can be used to dim high intensity signals. When a basic frame- time is defined, the micro-shutters can be opened for 100% of the frame-time thus letting 100% of the radiation through the shutter array for low radiation intensities. For higher radiation intensities the array (part or all) is opened for a fraction of the frame time. This method is applicable to both imaging and non-imaging sensors. In both cases, controller 1720 controls the openings of the shutter based on information from the sensor, as in the anti-blooming control described above. Camera shutters are used to control the timing and the amount of light reaching the film or a CCD array. Extremely fast shutters are used for "stop action" shots where a moving object is "frozen" in time. Most current cameras employ a mechanical shutter, which is physically inserted into the field of view to block the incoming light. However this creates a time shift along the path of the shutter. This is because areas of the film (or CCD), which the shutter reached first, are exposed to less light and blocked sooner than other areas which the shutter reaches only slightly later. Utilizing a shutter array, as described above, as a shutter for a film camera or CCD array allows simultaneous blocking of all the radiation reaching the target at once thereby eliminating the exposure time shift. In addition, since the opening and closing speeds of the array can be made very short and there is no limit to how long the shutter may remain open, the camera can be used over a wide range of light levels and exposure times. A personal anti-glare system is used as a means of preventing the blinding of a person operating a mechanical machine due to glaring. A prime example is the temporary blinding of a vehicle driver by the high beam of a vehicle approaching from the opposite direction or by the sun. A shutter array may be placed near the eyes of the operator (e.g., in front of eyeglasses). The shutters can then be used to dim the light coming from the direction of the bright source, when such bright light is detected by controller 1720. In one embodiment the controller detects the direction of the input light and of the operators head and reduces the amount of light from that direction. This requires both head position sensors, as known in the art, and direction sensors for the blinding input light, neither of which are shown in Fig. 17. Another method reduces the amount of light over the entire field of view. This has the advantage of simplicity. While reduction of the bright light will also reduce the amount of light in the darker areas, the reduction will prevent the temporary blindness that results from the glare of oncoming headlights. Some embodiments of these applications call for a single pyroelectric detector (sensor) to be exposed to external signals via an addressable shutter array in such a way that different spatial areas are exposed at different times. Thus a spatial image may be created by collecting the data obtained from different spatial points (directions) at different times. Signal Shutter" will indicate the maximal off-center radiation location (angle). The location of the "Maximum Signal Shutter" fed into a simple algorithm can calculate navigation correction requirements. Furthermore, measuring the PE signal during sequential operation of a (for example) 30x30 pixel array will create a simple image. It is noted that for this system, the pixel values are determined sequentially. The shutters may open in a more complex sequence e.g. each row is opened as per a predefined sequence followed the opening sequence of each column. Signals are fed into a simple processor that deconvolves the data. Possible advantages of this method are faster scanning and improved signal to noise ratio. Fig. 18 shows a schematic drawing of a system 1800 suitable for navigation and/or imaging using a pyroelectric detector (or other non-spatially sensitive detector). The same type of detector is also suitable for use in an intrusion detector system. System 1800 comprises a lens 1802 which receives radiation, such as infrared radiation, a shutter array 1804 at or slightly past the focal plane of lens 1802 and a single IR detector 1806 to collect the energy. A low cost microcontroller 1808 operates the shutter array, receives the PE readings and establishes the image and/or required navigation correction. It is noted that since PE has a very slow response and since lens 1802 focuses the incoming light, there is no need for an array of micro-lenses. The choice of the substrate on which the pixels are manufactured depends on the material transmissivity to different wavelengths. Aside from silicon and quartz other possible substrate materials include sapphire, which is transparent to optical radiation in visible to 5 microns, germanium, which is transparent in the 8-12 microns thermal window, or SnSe. The detector material is selected by considering inter alia the environmental envelope, required sensitivity and price impact on the system. Other possible candidates include InSb (Indium Antimonide), ZnSe (Zink Selenide) and ZnS (Zink Sulfide) and many other types available for Infrared. It will be clear that the present application describes a number of different elements, including, inter alia a rounded (or round) horizontal axle (or other element), a rolling axle, a pixel having a panel that changes position quickly and/or using a low voltage, a method of flipping the panel, a fabrication method and a method and apparatus for improving rise time for switched optical signals. It is understood that while these elements have been described in the context of a display or in the context of other applications, in order to teach the best mode known to the inventors for carrying out the invention, each of the elements described above is believed to have wider utility. Furthermore, while the elements have been described in the context where they work together in a single device, it should be clear that many of these novel elements can be utilized, in some embodiments of the invention, without any of (and certainly without all of) the others. For example, the flipping method shown will work with a pixel in which the axles have not been rounded or have been only been partially rounded. The rounded axles can be used with flipping methods described in the prior art and in the references listed in the related applications section. Furthermore, the elements described above can also be used to produce an RF (or other) switch in which the panel connects between two contacts (RF terminals) on the substrate when in the CLOSED position. This structure provides a very low RF path when the panel is in the OPEN position, since the panel is relatively remote from the contacts in this position. Apparatus suitable for providing this function is shown in isometric form in Fig. 19. In Fig. 19, one panel 1902 is shown in the OPEN position, two 1904 and 1906 are shown in the CLOSED position and one, 1908, is shown in an intermediate position. Each panel is formed with a conductive element 1912 on its underside. Situated under the conductive element and touching two ends thereof are contact pads 1914 and 1916. Thus, when the shutter is CLOSED, i.e., in a parallel position to the substrate, the switch is in its "on" state and an electrical connection is created between the electrodes. When the shutter door is OPEN, the electrical connection is disconnected and the switch is in its "off state. Since the design does not use torsion hinges thus avoiding material fatigue and can reduce needed actuation voltages. Uses for this micromechanical switch include Galvanic Switches for Telephony, xDSL Multiplexing, Test equipment, RF Switches for mobile applications, Phased Array Antennas, RF Filter Switching, Electronic Reconnaissance Systems and others. As a result of the wide flipper movement improved electrical decoupling (between the contacts) is achieved thus very-high open-state isolation is achieved. Furthermore, insertion loss is minimized by increasing the size of the contact area (design parameter) thus minimizing inline series impedance. Also, minimum energy is required due to the bi-stable nature of the shutter doors. Using the basic switch design a variety of switch type can be created including: Single Pole to Multi Pole (or viceversa), and Single or Dual Throw switches. To allow for a quick and forceful detachment of the switch door from the substrate even when a relatively large attraction force exist, an optional detachment lever may be manufactured nudging below the RF switch. This is illustrated below in Figure 20. 2014 and 16 are bridged by conducive element 2012. Since substantial attractive force may hold the switch closed, in an embodiment of the invention, a detachment lever 2016 is provided. Lever 2016 has an electrode 2018 associated with it which is electrified when the contact is to be broken. Electrifying electrode 2018 pulls the. left side of lever 2016 down (in the direction of arrow 2020) by electrical attraction and thus forces the right side of lever 2016 (which is situated beneath the end of switching panel 2002) upward in the direction of arrow 2022. This exerts a force to forcibly detach the contact and allow the panel to move from the CLOSE to the OPEN position. It will also be clear, the present invention has been described using non-limiting detailed descriptions of exemplary embodiments thereof that are provided by way of example and that are not intended to limit the scope of the invention. Variations of embodiments of the invention, including combinations of features from the various embodiments will occur to persons of the art. For example, rather than providing the pixels on a transparent substrate, they can be provided on an opaque substrate in which apertures have been formed. The scope of the invention is thus limited only by the scope of the claims. Furthermore, to avoid any question regarding the scope of the claims, where the terms "comprise," "comprising," "include," "including" or the like are used in the claims, they mean "including but not necessarily limited to". 1. A shutter for a transparent or apertured area, the shutter having an input and output side, comprising: a panel, arranged to selectably cover the area at a first position of the panel and to uncover the area in a second position; and an input light shaping element situated at the input side of the shutter and spaced therefrom, adapted to focus light that enters the array from the input side. 2. A shutter according to claim 1 wherein the panel opens toward the input side and wherein the lens has a focal point between the surface of the panel in the second position and the input lens. 3. A shutter according to claim 2 wherein the panel rotates substantially about a rotational axis thereof when moving from said first position to said second position; and . the panel has a given extent in a direction perpendicular to the rotational axis. 4. A shutter according to claim 3 wherein the input lens is spaced from the panel, when in the first position by a distance smaller than twenty times the given extent. 5. A shutter according to claim 3 wherein the input lens is spaced from the panel, when in the first position by a distance smaller than ten times the given extent. 6. A shutter according to claim 3 wherein the input lens is spaced from the panel, when in the first position by a distance smaller than five times the given extent. 7. A shutter according to claim 3 wherein the input lens is spaced from the panel, when in the first position by a distance smaller than twice the given extent. 8. A shutter according to any of claims 3-7 wherein the input lens has an optical axis and where an edge of the panel remote from the rotational axis crosses the optical axis during transition of the panel from the first to the second positions at point more remote from the, input lens than the focal point of the input lens. 9. A shutter according to any of claims 3-7 wherein the lens has an optical axis and where an edge of the panel remote from the rotational axis crosses the optical axis during transition of the panel from the first to the second positions at point closer to the input lens than the focal point of the input lens. 10. A shutter according to any of claims 3-7 wherein the input lens has an optical axis and where an edge of the panel remote from the rotational axis crosses the optical axis during transition of the panel from the first to the second positions at point having a given distance from the focal point less than 25 % of the focal length of the input lens. 11. A shutter according to any of claims 3-7 wherein the input lens has an optical axis and where an edge of the panel remote from the rotational axis crosses the optical axis during transition of the panel from the first to the second positions at point having a given distance from the focal point less than 10 % of the focal length of the input lens. 12. A shutter according to claim 10 wherein the given distance from the focal point is less than 5 % of the focal length of the input lens. 13. A shutter according to claim 10 wherein the given distance from the focal point is less than 2 % of the focal length of the input lens. 14. A shutter according to any of claims 3-7 wherein the input lens has an optical axis and where an edge of the panel remote from the rotational axis crosses the optical axis during transition of the panel from the first to the second positions substantially at the focal point. 15. A shutter according to any of claims 3-7 wherein the face of the panel has a smallest dimension of less than 1 mm. 16. A shutter according to claim 15 wherein the smallest dimension is less than 500 micrometers. 17. A shutter according to claim 15 wherein the smallest dimension is less than 200 micrometers. 18. A shutter according to claim 15 wherein the smallest dimension is less than 100 micrometers. 19. A shutter according to claim 15 wherein the smallest dimension is less than or equal to 50 micrometers. 20. A shutter according to claim 15 wherein the smallest dimension is less than or equal to 25 micrometers. 21. A shutter according to claim 15 wherein the smallest dimension is less than or equal to 10 micrometers. 22. A shutter according to any of claims 3-7 and including an output lens that focuses or collimates light that exits the shutter from the output side. 23. A shutter according to claim 22 wherein the output lens is spaced from the focal point or a conjugate of the focal point of the input lens at a distance equal to the focal length of the input lens. 24. A shutter according to claim 22 and including a relay lens to project the focal point to point more remote from the panel. 25. A shutter according to claim 22 wherein the output lens has a focal length substantially equal to the focal length of the input lens. 26. A shutter according to claim 22 wherein the output lens has a focal length different from the focal length of the input lens. 27. . A shutter according to claim 22, wherein the output lens has a focal length adapted to focus light exiting the shutter to a point. 28. A shutter array comprising: a substrate having one or both of transparent and apertured areas; and a plurality of shutters according to any of the claims 1-7 adapted to selectively cover and uncover the transparent areas. 29. A shutter array according to claim 28 wherein the input lenses associated with the shutters in the shutter array comprise an array of micro-lenses spaced from the panels. 30. A shutter array comprising: a substrate having one or both of transparent and apertured areas; and a plurality of shutters according to claim 22 adapted to selectively cover and uncover the transparent areas, wherein the output lenses associated with the individual shutters in the shutter array comprise separate output lenses for each shutter. 31. A shutter array according to claim 30 wherein the output lenses comprise an array of micro-lenses spaced from the panels. 32. A shutter array according to claim 30 wherein the input lenses associated with the individual shutters in the shutter array comprise an array of micro-lenses spaced from the panels. 33. A shutter array comprising: a substrate having one or both of transparent and apertured areas; and a plurality of shutters according to claim 22 adapted to selectively cover and uncover the transparent areas, wherein the output lenses associated with each shutter are comprised in a single lens for a plurality of the shutters in the array. 34. A shutter array according to claim 33 wherein the input lenses associated with the individual shutters in the shutter array comprise an array of micro-lenses spaced from the panels. 35. A system for light detection by a sensor on which the light is detected, the sensor including an input defining an input light path, the system comprising: a shutter array comprising an array of shutters comprising panels mounted on a substrate the panels being controllable to selectively allow light to pass through the substrate or apertures in the substrate, said array being situated in said input light path, wherein a face of said panels has a minimum dimension of less than 1 mm. 36. A system according to claim 35 wherein the sensor is an imaging sensor, and including • a controller adapted to selectively control the states of the shutters and to receive signals from the imaging sensor, the signals representing light sensed by the sensor; wherein the controller reduced the light reaching at least portions of the sensor based on the received signals. 37. A system according to claim 36 wherein in a first mode, the controller controls the shutter array to expose the imaging sensor for a first period; in a second mode, the controller controls the shutter array to expose the image sensor for a second period, responsive to signals received by the controller based on exposure during said first period. 38. A system according to claim 37 wherein in the second mode, the controller controls the shutter array to expose different areas of the sensor for different times during the second period, based on exposure during said first period. 39. A system according to claim 35 wherein the sensor is the eye of a viewer and including: a head mounting adapted to mount the shutter array in an optical field of view of an eye of a viewer; a separate sensor that is adapted to identify high intensity light in a field of view; a controller which is adapted to receive information regarding a position of said high intensity light in the field of view from the sensor and is further adapted to control the shutter array responsive to said information. 40. 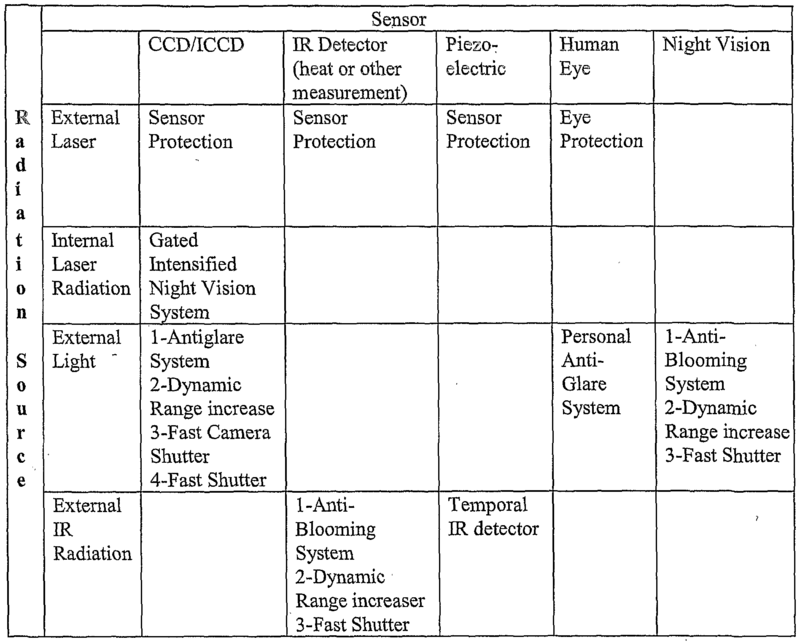 A system according to claim 35, wherein the sensor is an imaging IR sensor and including: a source of IR radiation adapted to illuminate a field of view of the sensor with pulses of IR; and a controller which is adapted to control the source and shutter array to block light from reaching the sensor for a given period after the pulses are generated to avid blooming. 41. A system according to claim 35 and including; a controller that is adapted to control the shutters in the shutter array to operate with a variable proportion of time in the first and in the second positions, said proportion being responsive to the intensity of light viewed by system. 42. A system according to claim 41 wherein the proportion is different for different portions of the shutter array. 43. A system according to claim 35 wherein the sensor is not an imaging detector and wherein a single input lens is used to focus the radiation on a plane and including: a controller that sequentially opens single shutter or groups of shutters to illuminate the sensor with irradiation and which receives information from the sensor related to the intensity of the irradiation; image generation circuitry that is adapted to generate an image of the variations in the input radiations based on the locations of the opened shutters and the intensity information associated with each opening. 44. A system according to claim 35 wherein the shutter array is a shutter array according to any of claims 28-34. 45. A method for generation of a radiation pattern comprising: providing a source of light, having a field of illumination; providing a shutter array according to any of the claims 1-7 placed in said field; and controlling passage of light through the shutter array. 46. A method according to claim 45, and including providing a photosensitive surface; wherein controlling comprises controlling the shutter array to illuminate the photosensitive surface with an image. 47. A method according to claim 46 wherein the photosensitive surface is a coating on a printed circuit board precursor. 48. A method according to claim 46 wherein an area of greater than 50 square centimeters is illuminated at one time. 49. A method of illumination comprising: providing a precursor of a biochip having areas thereon to be selectively irradiated to produce the biochip; and selectively irradiating said areas by controlling light passing through selected ones of the light valves in an array of light valves. 50. A method of illumination and detection, comprising: providing a biochip from which information is to be detected; selectively irradiating areas on the microchip by controlling light passing through selected ones of light valves in an array; detecting reflection from said areas. 51. A method according to claim 50 wherein the light valves are controllable shutters and wherein the array is an array of said shutters. 52. A method according to claim 51 wherein the shutter array is a shutter array according to any of claims 28-34.